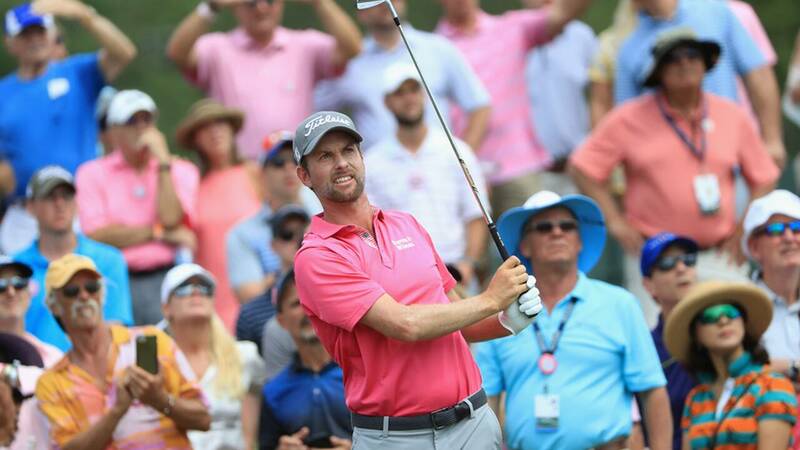 PONTE VEDRA BEACH, Fla. - Webb Simpson's game was at such a low point, years after his 2012 U.S. Open win that he admitted that he sat at the dinner table and cried, frustrated over the state of his golf game. Any tears shed Sunday were tears of joy after Simpson captured The Players Championship with an impressive score of 18-under par. Simpson, whose caddie is St. Augustine High School alum Paul Tesori, entered the final round with a seven stroke lead over his final-round playing partner, Danny Lee. He took a six stroke lead to the final hole, before hitting his second shot in the water and settling for double bogey. "It's hard to put it into words what this week has been like," Simpson said. "I always love coming here. Obviously this is where Paul and Michelle and Isaiah and Alexis live, so this place is special to me for that reason. I've never really played well, but I enjoyed the golf course. Sometimes in golf, it's just a mystery. Some weeks, something happens, and a good solid round the first round, and then second round was pretty special. You know, hung in there this weekend to get it done." There are at least two parts to this story. First, the story of Simpson's tenacity to keep working on his game despite not seeing the results. Second, the story of his relationship with Tesori, and the impact that this win could have on the First Coast. Before Sunday, Simpson had not won on tour since 2013. One of the big changes for his game began at The Players last year, when former Players champion Tim Clark gave him some putting advice. Tesori's family history with golf in Ponte Vedra goes back to his grandfather, who was a starter at the Ponte Vedra Inn and Club. "It means everything," Tesori said. "My grandfathers not here nay more. He died years ago, but when I talk about it with my dad, it means so much, He starts to tear up." Simpsons putting reached a high point this week. In each of his first two rounds, he gained over four strokes on the field with his putter. As for the impact through Tesori, it is likely to be significant. Simpson praised his caddie's support and loyalty through the tough times. "Paul has been just a great friend through all this, a great coworker," Simpson said. "Paul is such a great caddie, with such a great resume, that I never thought once that he would quit and go work for somebody else. But through that, I expected him to be frustrated at times, and he never was. He never got frustrated. He stayed positive on my worst days. He would try to give me a pep talk. I think to go through that, you need someone more than a caddie, you need a friend, and he definitely was that for me." Paul and his wife Michelle's son Isaiah was born with Down's Syndrome. Every year, the day before the tournament begins, the Tesori Family Foundation holds their All-Star Kids' Clinic, where they bring professional golfers to Sawgrass Country Club to introduce the game to special needs kids in the area. That's just one of the reasons why Tesori was feeling the love as much as, or more than, the pro he caddies for. "It was definitely Paul,100-fold," Simpson said. "I had to spend extra time in the morning warming up because he'd take forever to get from the putting green to the range. I call him the mayor. He's the mayor around here. Everybody loves Pauly." With the win, Simpson earns $1.98 million and a five-year exemption on the PGA Tour, three year exemptions to the U.S. Open, Masters and British Open and a one-year exemption for the PGA Championship.